Over the past couple of years there has been an amazing influx of new restaurants on Johns Island. Springing up in various locations along Maybank Highway, these blossoming eateries are in part a response to the vast array of produce grown on the island. Chefs who formerly spent their entire lives in major metropolises or even downtown Charleston have taken notice of the natural goodness growing in the nearby countryside, and many have moved their headquarters to the Maybank corridor. Places like Wild Olive, Fat Hen and Sunrise Bistro are offering seasonal menus based almost entirely on what’s growning within a 20 mile radius, and their efforts have not gone unnoticed. Maybank Highway on Johns Island has become a destination for foodies, farmers and fresh-food fanatics alike, and the trend is growing with delicious results. In February of this year, Hickory Hawg, a local barbeque restaurant, closed its doors for the last time. But with the loss of a well-loved dining spot came an opportunity for former J. Paul’z owner Paul Farrell and his investment partner, David Christopher. While Paul was quick to point out that there is a lot of good pizza around the Charleston area, he and David noticed that there wasn’t a place that served “mid-western pizza”. What’s mid-western pizza? According to Paul, it’s a thin crust pizza with toppings that travel all the way to the edges, leaving little to no crust on the rim. Sauces vary from traditional tomato base to barbeque, garlic and even hummus, and toppings are almost always added at the very end. If it doesn’t need to be melted or warmed, it’s added fresh before the pizza is served. With roughly 12 incredible specialty pizzas and the option of an original Chicago deep dish pizza on the menu, Paul and David have obviously been working closely with their new head chef, Stephen VanHooser. Stephen, a former chef at Cypress and West Ashley’s Glass Onion, has brought with him a deep understanding of the Charleston appetite and a mind for working with seasonal ingredients. Between the three of them, Paul guesses that they must have eaten at least 200 pizzas just to nail down the restaurant’s signature house tomato sauce and homemade crust. As for the name of the island’s new pizza place, Paul simply shook his head and laughed. “We had already named the restaurant when the movie came out,” Paul smiled, in reference to the latest movie in the Twilight vampire series which has taken the adolescent market by storm. New Moon Pizzeria and Pub is a reflection of Paul’s fine-dining-at-low-cost ideals. Consisting of fresh, local ingredients, a menu which changes with the seasons and several creative dining options, Paul, David and Stephen are shooting for the moon and hoping that the rest of the island will enjoy their modern twists as well as their slices of traditionalism as much as they do. In fact, several local residents have dropped by to see what’s going on in the former Hickory Hawg and Paul has been happy to explain the new concept. Along with the idea of monthly pizza specials created by locals and live music several nights a week, the New Moon crew hopes that the pizzeria will be a place for families to enjoy a good meal, for locals to hang out and chat and for everyone to be able to taste a new spin on the bounty of Johns Island. 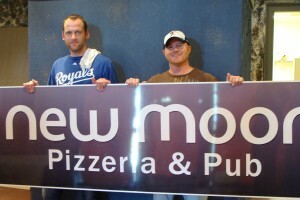 New Moon Pizzeria and Pub is expecting to have a soft opening on Saturday, May 1. The restaurant will be open Monday – Thursday, 5 p.m. – 12 a.m.; Friday and Saturday from 5 p.m. – 1 a.m.; and Sunday from 12 p.m. – 5 p.m. New Moon is located at 2817 Maybank Highway. For more information, visit newmoonpizza.com. Mustard-based sauce covered with our special cheese blend, grilled chicken, bacon and topped after baking with tomato, yellow peppers, jalapeno peppers and pineapple with buttermilk ranch dressing.